Directions: Follow James Madison Highway (Route 15) to the Village of Fork Union. The church is located on the east side of the Highway, about 1 city block north of the BB&T Bank, just north of the southern "Fork Union" town limit and "Bird Sanctuary" signs. We worship at Fork Union Presbyterian Church at 11:00 am on the second and fourth Sundays of each month. On the first and third Sundays, we worship at Arvon Presbyterian Church, and on fifth Sundays, at Trinity-New Canton Presbyterian Church. 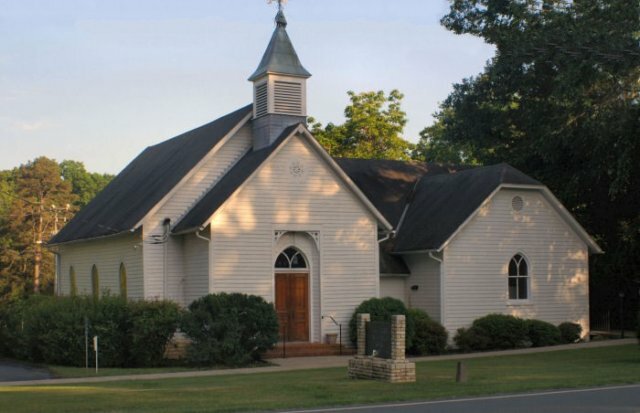 Although Presbyterians have long played a prominent role in the historical development of Fork Union and, indeed, of Fluvanna County, there is today only one organized group in the County - those attending Fork Union Presbyterian Church. The attractive church building and an adjacent Sunday School edifice, both of wooden construction in a style reminiscent of New England Congregationalist structures, are located on United States Highway 15 at the southern end of the village. Relatively small in number, the Presbyterians are a dedicated, enthusiastic, and devoted group, worshipping and working together as they contribute significantly to the higher moral and social climate of the village. The first mention of Presbyterians in village history dates to 1824 when they were the owners of one-fourth of the Brick Meeting House and using its sanctuary one Sunday each month, sharing the building with three other Protestant denominations. Mr. Benjamin Seay, an elder in the Trinity Presbyterian Church at New Canton in Buckingham County, lived in Fork Union at this time and served as the leader of the Presbyterians. Mr. Seay was usually able to secure the services of the Trinity pastor for a monthly "Presbyterian Day" at the Brick Meeting House; when unable to do so, he led the services himself with the help of church members. This situation continued, occasionally varied by the appearance of guest speakers or advanced seminary students, until Mr. Seay's death in 1849. From 1849 until 1900 Presbyterian Church history at Fork Union is best described as uncertain, if not disorganized. This is not to suggest that the Presbyterians were lacking in sincerity, depth of conviction as to religious beliefs, or earnest desire to develop and carry on a viable church program. Rather, the membership was not sufficiently large to support a regular pastor, and economic conditions were very poor. In 1854 they owned one-fourth of the new Corinth Church, and this activity, plus later developments, prove the Fork Union members kept their organization alive. In September, 1900 the Reverend B. F. Bedinger, Evangelist of the Synod of Virginia, held a revival meeting at Fork Union. A number of individuals made professions of faith, a larger denominational spirit was aroused, and a petition was sent on October 24 to the West Hanover Presbytery asking for the organization of a new, separate church. In November the Synod received the Fork Union Petition from West Hanover Presbytery, approved it, and appointed a commission to organize the new church "if the way be clear." The commission canvassed the Presbyterian condition at Fork Union thoroughly, and on November 16, 1900 the church was formally organized by it. In 1909 land was donated for a Presbyterian Church building site by Elder and Mrs. Samuel Seay, and the new church was completed in 1911. While awaiting the construction of their church, Presbyterians met at Arvon schoolhouse. Reverend Plummer F. Jones was called as the first pastor of the group, and he served until 1936. In 1958 the Sunday School Building was completed. The fund for this construction had been started in 1957 by a gift from Dr. T. Bolling Gay. On December 22, 1974 the church celebrated with special services the one hundred and fiftieth anniversary of Presbyterianism in the Fork Union community. The Fellowship Hall, which joined the Sanctuary portion of the building with the originally detached Sunday School Building, was dedicated in 1995. 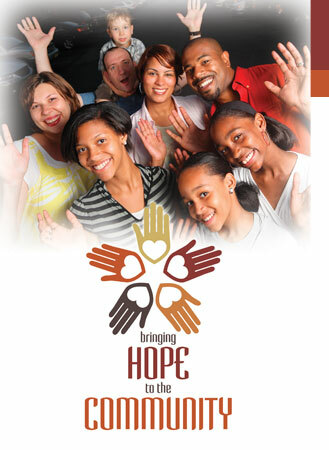 Fluvanna Christian Service Society is a wonderful ministry of assistance for those in Fluvanna County. Christ Presbyterian Parish has long been active with this group, and we invite you to join us in attending this meeting! Fluvanna Christian Service Society is an ecumenical group of pastors and lay people from Fluvanna County churches established to focus on the needs of this county's residents and to find ways in which those needs can best be met. Programs include maintaining a community Food Bank and providing fuel assistance as well as other short-term essential services. Two community worship services - a Baccalaureate service for the Fluvanna High School graduating class in May and a Thanksgiving service in November are held each year. The Happy Face Christmas event provides a day of gift giving, holiday food baskets and a Santa party for the children and senior adults who qualify for assistance. Churches offer financial support through their respective budgets as well as special offerings and are represented at the monthly board meetings. Volunteer opportunities abound in all of these activities.